Covers The Arctic Cat Wildcat 650 and El Tigre EXT. 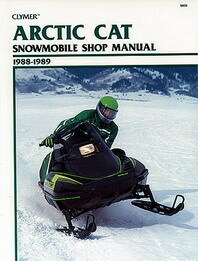 This Clymer repair manual is for the Artic Cat snowmobile spanning 1988-1989. It covers the Wildcat 650 and El Tigre EXT models. Clymer snowmobile repair manuals are considered to be the only snowmobile repair manuals worth owning. They are used by some of the most prestigious professionals to your average everyday snowmobile owner. Along with superior design Clymer snowmobile repair manuals always provide the most up-to-date information available for your snowmobile. The manual is 400 pages in length and the expert text gives you complete information regarding maintenance, tune-up, repair and overhaul.